Lobio is a dish of stewed beans, tomatoes and onion, originating in the Caucasus area (Georgia, Azerbaijan). It is said to have its origins in the area known today as Georgia, the former Soviet republic. As with many Georgian dishes, lobio is spicy, but not necessarily hot. One of the traditional recipes for lobio does not call for hot peppers (as other recipes do) but relies solely on ground black pepper for its spice. This tendency is not uncommon in Russia, where spicy more often does not denote hot, but instead flavorful. While there are many ways of making lobio, the earliest is undoubtedly the clay pot. 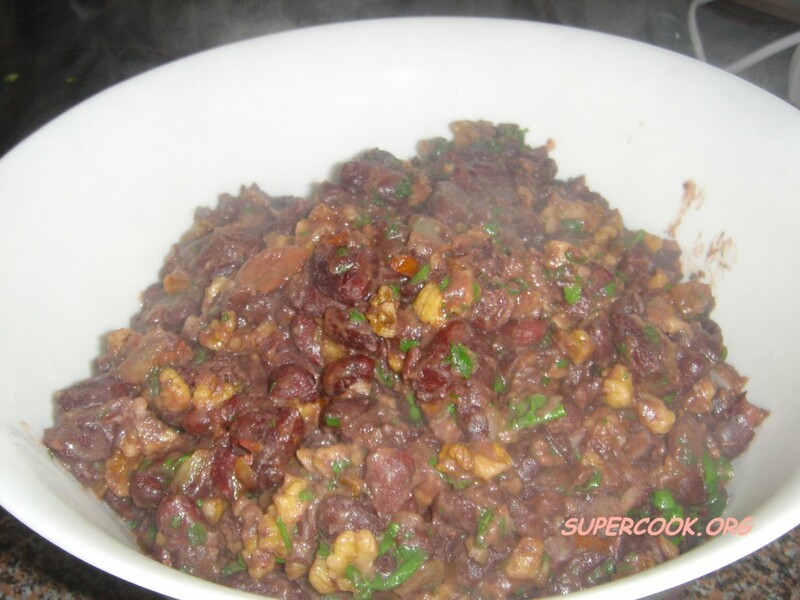 Red kidney beans would be put in the pot with water and spices and allowed to sit overnight. The following day, the pot would be placed over a fire or, if available, in a small exposed oven, and the beans slowly cooked. At the appropriate stages, meat and other vegetables would be added to cook. The cooked lobio would then be served in the clay pot, along with a flat bread. In this form, lobio resembles early dishes that start with a basic ingredient such as a starch, legume, or wheat, which is then cooked with whatever other foodstuffs and flavorings are available. The fewer available foodstuffs, the more beans are added. An early recipe for lobio calls for soaking the kidney beans in water with two mashed cloves of garlic, and a handful of basil, mint, and parsley. After soaking, the beans would be cooked in this same water. Once cooked, any excess water was drained, oil was added along with meat, vegetables, and tomatoes. This was then cooked slowly until the meat and vegetables were done (often, the water would be retained to make up for a lack of oil). Lobio, in its traditional format, progressed to become a standard recipe the ingredients of which varied depending on the area in which it was cooked. Lobio spread from Georgia to other southern areas of Russia (often referred to by different names in different dialects). Sometime in the early 1800's, lobio was transformed as part of fondness of the Russian aristocracy for elaborate dinner parties that began with a full table of hors d'oeuvres, and then proceeded through at least six courses. Lobio became an appetizer. In this form, the beans were soaked and cooked, without spices, and then mashed into a paste. This paste was combined with finely minced onion, cilantro (or other available herbs with a sharp flavor) and combined with olive oil and lemon juice. Into this, a great deal of ground black pepper was added. The final product was then allowed to sit for a minimum of six hours. It was then served on either toasted bread or a flat bread. Throughout much of Russia today, this appetizer is what is known as lobio.